I migrated to NSU bicycles from NSU motorcycles and the NSU Quickly moped, which took the world by storm when it hit the market in 1954. This bicycle has a number of decorative features in common with the NSU Quickly moped. The company was renowned for quality manufacture. Although NSU made modern bicycles too postwar, this example is one of the company’s ‘nostalgic’ models, designed to appeal to older riders. The front brake is a ‘plunger’ type, pressing down onto the front tyre. 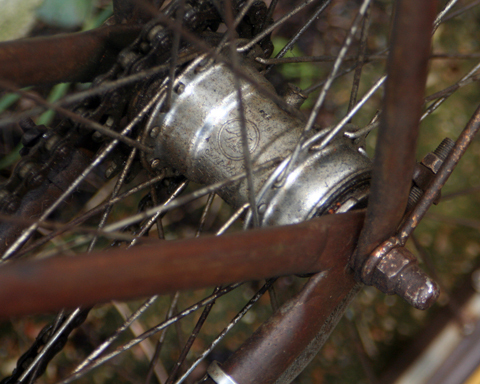 British bicycles updated their front brakes soon after the turn of the century, but Germany retained this feature: it was cheaper to manufacture and supplemented the rear coaster brake. I like the extra badges fitted to the front mudguards of most German bicycles. The ‘fender ornament’ on NSU is similar to that used on the range of NSU mopeds that quickly dominated the cyclemotor market from 1954 until the Honda Cubs took over in the early sixties. Compare the badge below (on the 1958 Quickly Model L). 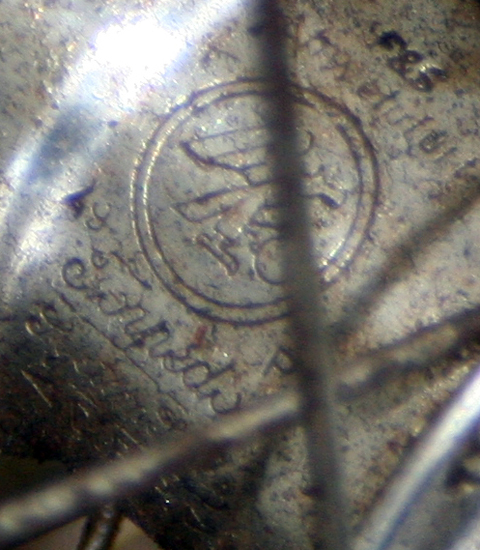 In the close up photo below you’ll see the number ’49’ which shows the hub’s year of manufacture as 1949. The company was started in 1873 in Riedlingen an der Donau, Germany. In its early years, its founders Heinrich Stoll and Christian Schmidt produced knitting machines. They soon moved to Neckarsulm, and adopted the name NSU from NeckarSUlm. When the bicycle market started to boom, NSU joined many other bike manufacturers and their cycles proved very popular. Developed from a bicycle, their first motorcycle was introduced in 1901; it was fitted with a 1.5hp Swiss Zedel engine. The picture below shows their factory in 1904. By then, there was already a choice of 6 different models. In due course, they added cars, taxis and trucks to their comprehensive motorcycle range (in 1909 they even made a 990cc V-twin motorcycle). The car division was sold to Fiat in 1928. However, NSU did build a car a few years later: in 1933, they were commissioned by Ferdinand Porsche to build 3 prototypes ‘Type 32’s’ – this was in effect the first Volkswagen Beetle. One of these original cars is in the VW museum, and you can see below how similar the NSU Type 32 is to the eventual Beetle design. NSU built many fine bicycles motorcycles throughout their history, and to my mind their name is synonymous with quality German engineering. This is from the Online Cyclemaster Museum. There’s no definite official information about part numbers and corresponding registration years. This data is approximate. With an accuracy of + / – one years, but they are assumed to be relatively safe. 1946 Renumbered: Prewar numbers re-used. For example, 800,000 might be 1935 or 1956. From 1957 / 990,000 Onwards: NSU used the same numbers as prewar again, so it’s confusing.